As long as you’re involved in the digital age, you will easily realize that the era of HD has been shifted to 4K UHD. With high clarity and sharpness, videos have seeped into all aspects of our daily lives. You can easily get 4K video from video streaming sites like Netflix, capture videos with iPhone, HD camcorders, GoPro or drones. However, technology is a double-edged sword. We could enjoy amazing viewing experience brought by while a complaint about the technical issues caused by 4K videos as well, such as bulky file sizes, format incompatibility with video editors and the impossibility for sharing online. In this case, software that can reduce the file size of the videos, convert and edit 4K becomes a must have for all video enthusiasts. Taking usability, video converting capability, output quality and speed into account, MacX Video Converter Pro stands out as the best video processing tool of this kind. Built-in 370+video/audio codecs, MacX Video Converter Pro provides an ultimate solution to convert 4K UHD video in any formats. You can easily convert 4K UHD video to MP4, MOV, HEVC/H.265, AVI, FLV, WMV, MKV, MP3 and 200+ others. This video processing tool also makes it super easy to convert videos to Apple or Android mobile devices. Only three steps – input the source video, choose the output format and then you can do 4k video processing to any format or device with no compromise in video quality. Generally, a 1 min 4k resolution video at 30 fps steals over 375MB of free space, while 18-hour videos shot by DJI P4P will eat up Mac’s 512GB hard drive space. If you want to store more 4K videos on a space-constrained smartphone or a cloud service, to reduce video size is essential. MacX Video Converter Pro can help you compress and resize large video files into smaller resolutions including 1080p, 720p, H.265 and more. You can significantly reduce the size of the video for convenient storage or upload to Youtube, Facebook etc. If you are a shutterbug, I believe you’d like to do more with your 4K recordings to make them into a video masterpiece. Why not? Besides powerful conversion and compression features, this video converter also comes with handy video editing ability. It empowers you to cut unnecessary content, split the video into smaller pieces, remove the flawed or unwanted bits, merges multiple recordings into one, watermarks the footage to make it personalized, change the frame rate, bit rate, codec and other parameters of your videos. Moreover, hardware acceleration is another point of MacX Video processing tool that’s worth mentioning. 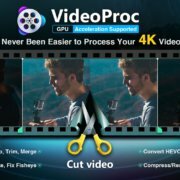 MacX Video Converter Pro integrating hardware acceleration technology based on Intel QSV, Nvidia, and AMD graphic processing units (GPUs) can convert 4K video at 5x speeds. For instance, converting a 22-minute-long video MKV (AVC Codec) with a resolution of 3840×2160 and a file size of 2.5GB into an MP4 using MacX Video Converter Pro takes only under 5 minutes with an average of 150 frames per second. By contrast, HandBrake for Mac outputs an average of 18 fps at best and takes half an hour to process the video. If you are someone who works a lot with 4k video processing and is looking for the best software your Mac, then the MacX Video Converter Pro would be your best choice, without a doubt. MacX DVD Pro is the best 4k editing software which can compress, convert and edit videos, it is an all-in-one program full of other useful features, such as online video downloading, screen recording, slideshow making and more. So we sincerely recommend you to give the video processing tool a try. And we believe it will leave you completely satisfied.